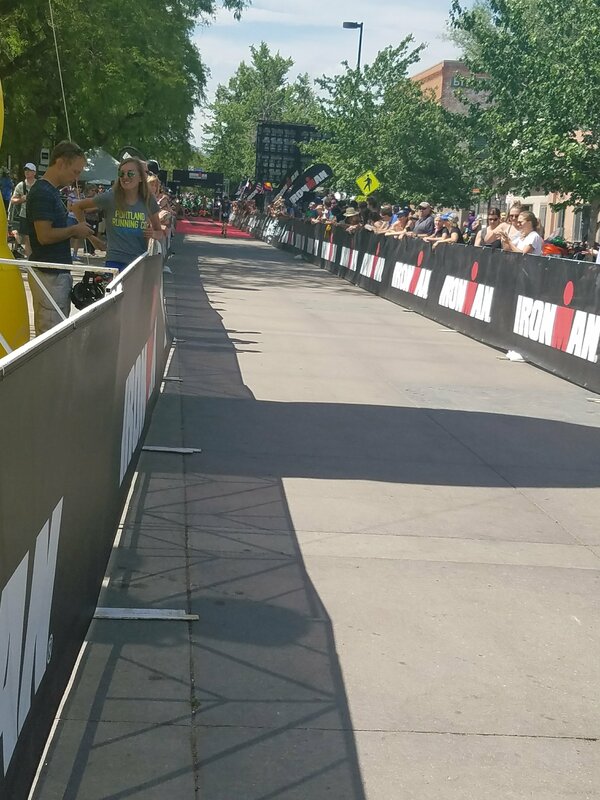 This weekend I happened to find out the full Ironman was being held in Boulder, CO not far from where we’re parked. I absolutely wanted to take a peek at that race! The FULL Ironman consists of a 2.4 mile swim followed by 112 mile bicycle ride and topped off with a full marathon (26.2 miles). In case there is any misunderstanding – they do all these things, in this order AT ONCE! (Not, say, iver a weekend.) These athletes are the top of the top! And I’m just talking about the amateurs. Pros race too, of course. Since we’ve been full timing we have found it difficult to keep a consistent workout schedule. This is a big deal since we’ve both always been athletic. We put on weight, lost some and then put some back on. Ugh! But we’re back to a downward trend and watching the Ironman have me the push I needed to realign my priorities. I dont aspire to do an Ironman or even a half Ironman. But I do want to do more triathlons! I used to live in Colorado. I loved it! The mountains, the sunshine, the people. Did I mention the sunshine? 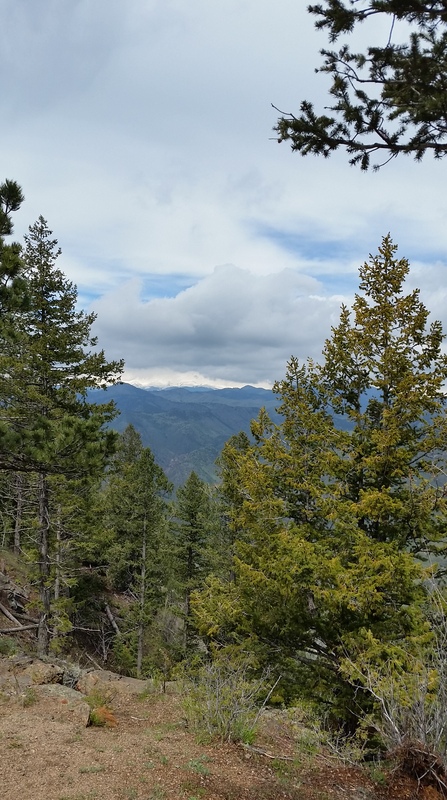 How about the beautiful snow-capped mountains?? I have been going on and on to Mike about how awesome Colorado and Denver are. I couldn’t wait to get from California, back across the Rockies, to introduce him to this amazing part of the country. We timed it just right, too. The snow appeared to be finished for the season as we worked our way through the high-walled gorges and then through the ski resort towns. Arapahoe Basin seemed to still have some snow on her surface – I could make out the moguls on the slopes – but the ground was clear. The Eisenhower Tunnel was clear and open. These are the things you consider when crossing the Rockies, especially when towing a 16,000 camper! Colorado does a great job of keeping motorists informed of road conditions! If you’re heading through the area I highly recommend this site to see if the roads are clear. You can choose your interstate and it gives you the conditions by mileage section. Very helpful on long hauls! I had us booked to stay with friends for a few days then on to Chief Hosa Campground in Golden. I could hardly contain myself! 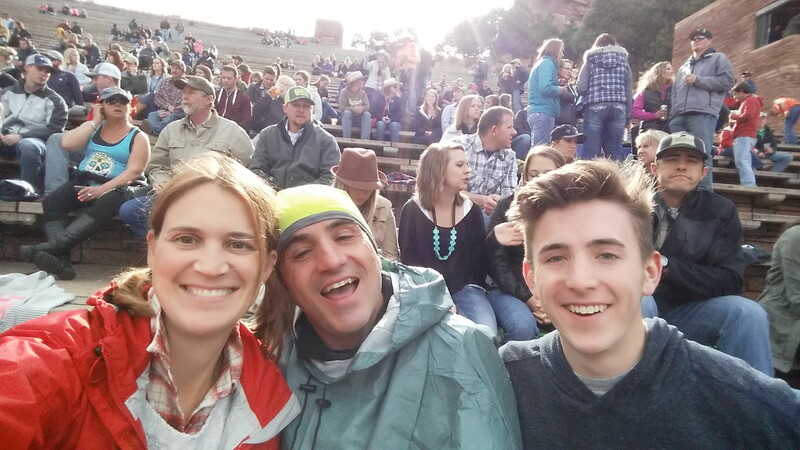 Finally getting back to Colorado, seeing friends, knowing I was spending Memorial Day weekend in Golden AND we had tickets to a concert at Red Rocks Amphitheater! This couldn’t get any better! As we rounded the edge of the pass the sky started looking cloudy. Then rainy. We drove into Denver in rain. Denver boasts 300 days of sunshine, more than San Diego and Miami Beach! And we arrive in rain. But not worry – just hang around a day or so and it’ll clear up, right?? 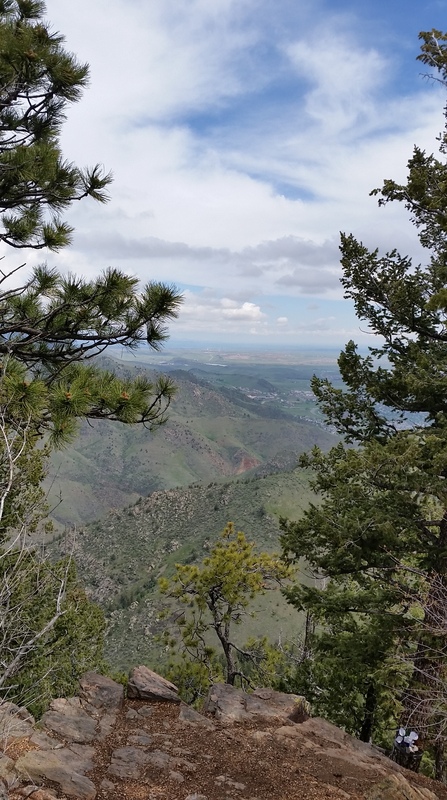 Our plans had us in the front range and Golden for seven days. IT RAINED the first FOUR DAYS! Turns out, it’s been one the wettest Mays Colorado has seen in quite a while. Rivers were flooded, farmer’s fields were swampy messes, some people living on old farm houses on rivers evacuated. It was not a normal time to be in Colorado. Finally, on Z’s last, full day, it started to clear up. 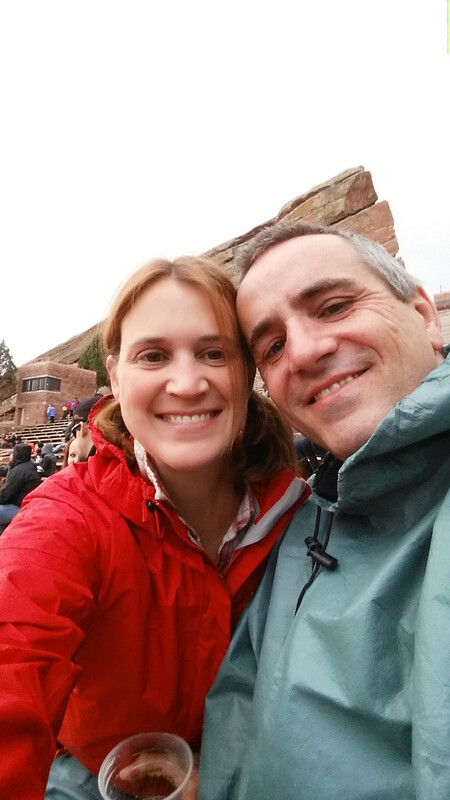 We did a little hiking, headed into the town of Golden and prepared for the concert at Red Rocks that night. The forecast was predicting heavy rain but we figured we’d go, stay as long as we could and leave when the rain got too bad. 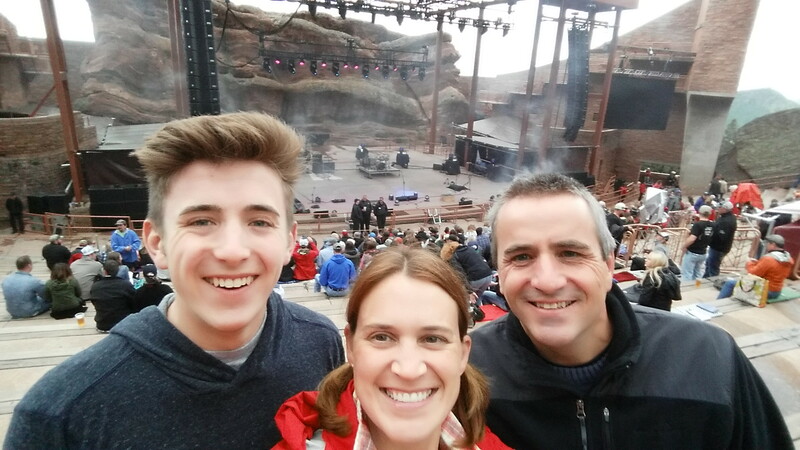 Side note – If you’re in the Denver area check out Red Rocks and see who’s playing. If it’s someone/a band your even marginally interested in GO! This is, by far, hands down, the best music venue! It’s a natural, rock amphitheater. 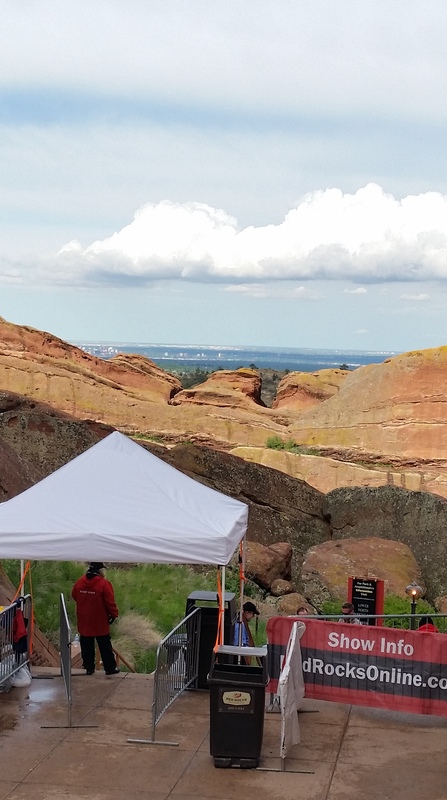 The acoustics are unbelievable, the scenery of the sandstone monoliths framing the panoramic view of Denver is breathtaking. Just go. We ended up staying for most of the concert! The rain never came! (at least while we were there!) We had to head out since we had to get up at *ahem* 4am the next morning in order to get Z up, ready and to the airport for an early morning flight home.